Coming into the 2013-2014 NHL season, the Pittsburgh Penguins were once again set to be a favorite to compete for the Stanley Cup. In particular, defense was set to be a big-time strength for the Pens, led by Norris Trophy finalist Kris Letang, along with Paul Martin and Brooks Orpik. The Pens also signed veteran Robert Scuderi in free-agency, who was a huge part in the Pens winning the Stanley Cup in 2008-2009. Aside from the veterans, the Pens had a number of talented prospects that looked ready to contribute in 2013-2014. Simon Despres was supposed to be the main guy to step up. Last year, Despres looked really good for the majority of his playing time, and even developed a bit of a cult-following on social media. Dan Bylsma backed up Despres during the offseason claiming that Despres is "a top-four defenseman". Robert Bortuzzo was another young candidate that was supposed to have a chance to make an impact on the team. On top of that, a breakthrough 19-year old rookie defenseman, Olli Maatta, blew everyone away during preseason. Despite an ongoing debate, the Pens ended up making the right decision to keep Maatta up in the NHL for the entire year, because he was too damn good to send back to juniors. All of this lead to the "Trade Matt Niskanen" campaign, by bloggers, journalists, and fans. Hell, even I said that they should look to trade Niskanen back in the offseason. Before the season started, the option to trade Niskanen looked like an easy one to make. The Pens needed cap-space and more depth at forward, while Niskanen was deemed as the most replaceable player on when it came to defensemen. When you added in Niskanen's $2.3 million cap-hit, it was almost a no-brainer. In fact, ever since Niskanen was acquired from the Dallas Stars, he's been a pretty forgettable player when it comes to the Pens. Niskanen was part of the trade that sent promising defensive prospect Alex Goligoski to the Stars in return for Niskanen and James Neal. Neal was obviously the big catch and has turned into one of the best scoring wingers in the NHL, developing great chemistry with Evgeni Malkin to boot. Niskanen was known as the guy that fought Sidney Crosby that one time. But then things changed....The injuries crushed the Pens' blueline. Letang missed the first nine games of the season with an injury, and has since been placed on the injured-reserve after suffering a stroke. Paul Martin is also currently on the IR and has missed 31 games to this point. 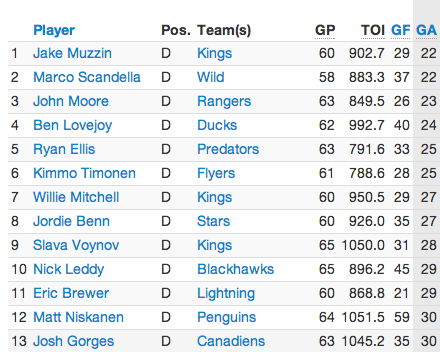 Add in Scuderi, who also missed 29 games this season. Between the injuries and the improvement from last year that Niskanen showed early on, it was getting more and more obvious that the Pens should and had to hold on to Niskanen. During the first month of the season, Niskanen had eight points in 13 games, and lead the Penguins with a +10. Then came a stretch of games from December to January where Niskanen had 21 points in 25 games, including 4 game-winning goals, and a +15 plus/minus. For the season, Niskanen leads the entire NHL in plus/minus with a +31. For the advanced statistics lovers, Niskanen fairs well in those categories as well. In fact, Niskanen leads all NHL players in goals for % and goals for relative to the player's to team's goals for percentage when that players is not on the ice. Jesse Marshall, from Faceoff-Factor.com pointed out on Twitter that Niskanen leads all NHL players in being on the ice for the most goals for. 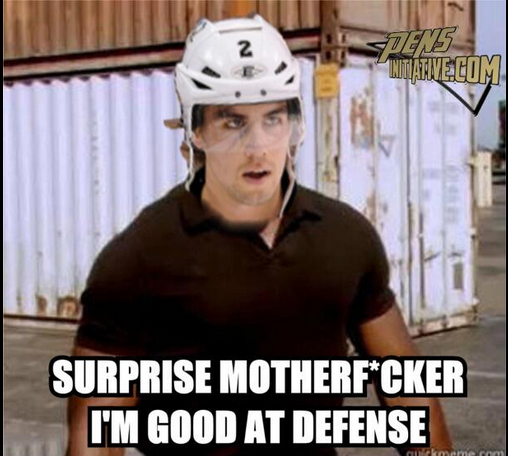 Niskanen has been on the ice for 65% of the Pens' goals this season, which leads the NHL and obviously the Pens. Niskanen has carried the Penguin's defense this season, leading the team across the board in points, plus/minus, assists, corsi rating, fenwick, shooting percentage, and save percentage. Niskanen has also formed into a clutch player so to speak, leading all defensemen in game-winning goals with six. The NHL record for game-winning goals by defensemen in seven, shared by Ray Bouqure, Derek Morris, Dion Phaneuf, and Al MacInnis. It might be an arbitrary statistic, but it just helps show how improtant Niskanen has been for the Penguins. As good as Niskanen has been offensively, Niskanen's improvement on defense has been out of this world. Perhaps no player in the NHL has had this big of an improvement in one season. Out of all of the defensemen that have played at least 90% of their team's games this season, only 11 have been on the ice for fewer goals in a five-on-five situation. Out of those 11 players, none of them have played more minutes than Niskanen. Not bad for a guy that was an afterthought when he was acquired, huh? Safe to say that Niskanen's career-year came in the perfect season for him and the Pens. So he's having a good year.... now what? Is this a fluke? Is Niskanen really this good or is this one of those scenarios where a guy plays over his head for one season? I mean we've seen that before, especially in hockey. But it's not like Niskanen doesn't have a pedigree. Niskanen was a first-round pick by Dallas in 2005, and has shown flashes of playing this kind of two-way hockey. After all, he's only 27 years-old, which is a perfect age for an NHL defensman to come into his own. Niskanen, is just now entering his prime. He's a savvy puck-carrying defenseman that doesn't play an overly-physical style of hockey. He doesn't fight often nor does he block an absurd amount of shots, so the wear and tear of his body won't be similar to guys like Orpik and Scuderi. Instead, Niskanen uses his skill, skating ability, and positioning to anticipate the play, gain the puck, and help the team breakout out of the defensive zone. Niskanen's style of play will help him stay healthy and hopefully productive for a long time, hopefully well into his 30's or early 40's. This is why the Pens should do whatever they can to re-sign Niskanen, even if the price is around $4.5 million-per year, which is what Niskanen could realistically get on the open-market thanks to an increased salary cap. The Pens will have a lot more room to work with when it comes to the cap and in no way should they consider bringing the beaten down body that is Orpik back after this season. They have Maatta to anchor the defense, but with Letang's health up in the air and the fact that Martin has had a problem staying healthy, the Pens should do whatever they can to keep Niskenan around, because the Pens could be in a similar situation once again next year. Add in the fact that Niskanen is seemingly a perfect fit for Bylsam's system and it should be a no-brainer. Although, you chould easily picture a team drastically overpaying for Niskanen. No matter what, you have to appreciate the year that Niskanen is having. From being castoff as trade bait by everyone that covers the Pens to being one of the most important defenseman to the NHL, it's truly a great story. Leturnover gets close to 8mil next year. You think Nisky is only gonna get 4.5mil? Some team will over pay for one of the best d-men on paper (I said on paper). Pens D could be overhauled next season, with kept assets and expiring contracts maybe we get lucky and can pay Nisky. Go Pens!